Cornell University recognizes the important connection between our purchases and our support of a sustainable economy. 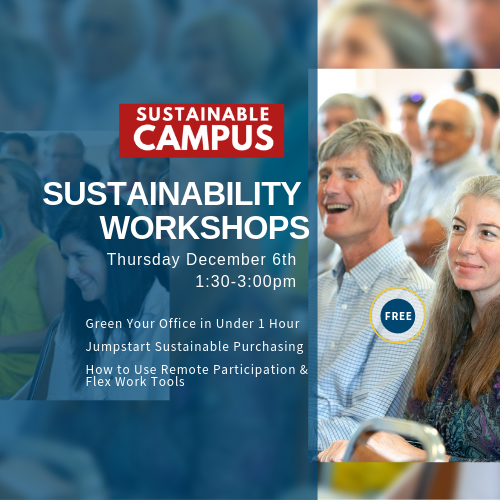 This workshop will help attendees learn about Cornell's existing tools and guidelines for sustainable purchasing. The workshop will advance your leadership and professional skills by covering how to purchase more sustainable products using E-shop, Cornell's existing Sustainable Purchasing Guidelines and tools to help you or your team implement them, how to effectively evaluate the sustainability of purchases, and our goals as a University around sustainable purchasing. REGISTRATION REQUIRED. Deadline to regsiter is December 30th. We strive to host inclusive, accessible events that enable all individuals, including individuals with disabilities, to engage fully. To be respectful of those with allergies and environmental sensitivities, we ask that you please refrain from wearing strong fragrances. To request accessibility and disability accommodations, please contact sustainability@cornell.edu.